Antique 18C Kangxi Period & Marked Chinese Porcelain Plate Long Liza Qing China. 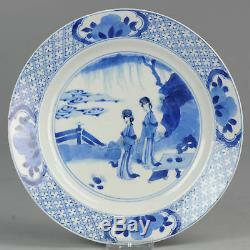 Lovely Chinese Porcelain plate of very high quality. Overall Condition B (Good Used); Rimfritting & 1 hairline. 18th century Qing (1661 - 1912). We can not control this. For China (& rest of Asia) & US allow at least 2 to 3 weeks. Depending on the situation it can take up to 1.5 month. This also influences the tracking data shown online. You can follow it at. The item "Antique 18C Kangxi Period & Marked Chinese Porcelain Plate Long Liza Qing China" is in sale since Sunday, April 30, 2017.